The earth receives enough energy from the sun in 15 minutes to provide all mankind's energy needs for one year. As such, solar energy is a vast renewable energy resource with the potential to provide clean energy for all, and offset the climate-altering effects of fossil fuel burning. Solar photovoltaics (PVs) are devices that convert the energy of sunlight directly into electricity. They operate silently, have no moving parts, and produce no pollutant emissions during their operating lifetime. They are ideally suited for energy generation within the urban environment and can be incorporated into a host of novel architectural materials. The ECI is actively researching technical, social and policy aspects to promote best-practice installations and encourage the growth of a strong UK solar PV market. The solar PV Compare project is a comparative test of commercially available photovoltaic (PV) technologies. Eleven different sub-arrays have been mounted on a roof in SAlqueria, Mallorca and, uniquely for studies of this type, an identical system has been established at Begbroke, near Oxford, UK. This enables the technologies to be tested not only side-by-side, but also under a wide range of climatic conditions. The project is important as an informative tool for retailers, systems designers and product developers. At present information about PV performance is somewhat limited, being restricted to laboratory data, rather than actual operating conditions. The PV Compare project aims to fill this knowledge gap. The PV-Compare project is presented through a 20 page report, available from the ECI. This report presents the compared performance of commercially available photovoltaic technologies under real-life operating conditions. We have determined the expected annual energy yields for each technology and the reasons behind this performance under a wide range climatic conditions. As such, it provides an indispensable guide for PV system designers, architects and energy advisors as well as the interested individual. 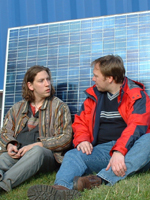 Christian N. Jardine and Kevin Lane, "Photovoltaics in the UK: An Introductory Guide For New Customers". ECI Report 27, 2003. Christian N. Jardine and Kevin Lane, "PV-COMPARE: Relative Performance of Photovoltaic Technologies in Northern and Southern Europe", PV in Europe Conference and Exhibition, Rome, 2002. Jardine, C.N., Lane, K., Conibeer, G.J., "PV-Compare: Direct Comparison of Eleven PV Technologies at Two Locations in Northern and Southern Europe", 17th European Conference on Photovoltaic Solar Energy Conversion, Munich, 2001. Christian N. Jardine, T.R. Betts, R. Gottschalg, D.G. Infield and Kevin Lane, "Influence of Spectral Effects on the Performance of Multi-junction Amorphous Silicon Cells" [PDF: 986KB] PV in Europe Conference and Exhibition, Rome, 2002. R. Gottschalg, C.N. Jardine, R. Rüther, T.R. Betts, G.J. Conibeer, J. Close, D.G. Infield, M.J. Kearney, K.H. Lam, K. Lane, H. Pang, R. Tscharner, "Performance of Amorphous Silicon Double Junction Photovoltaic Systems in Different Climatic Zones" [PDF: 246KB] 29th IEEE Conference for Photovoltaic Specialists, New Orleans, 2002.